Education, Mathew Opoku Prempeh, has accused ex-president John Mahama of being responsible for the "childish" comments made by the Member of Parliament for Odododiodoo, Edwin Nii Lante Vanderpuye. Nii Lante Vanderpuye has suggested in a widely circulated audio that the opposition party will free jailed former National Coordinator for defunct Ghana Youth Employment and Entrepreneurial Development Agency (GYEEDA), Abuga Pele if the party won power in the 2020 polls. But according to Opoku-Prempeh, Nii Lante Vanderpuye is not matured politically hence his resort to politicise an issue that needed non-partisan collaboration to cure. “I’ve always known that Nii Lante is a child when it comes to politics. But on a more serious note, the person I will blame is Mahama, blame Mahama for Nii Lante’s childish talk. 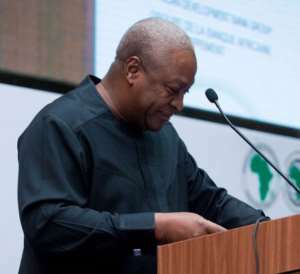 “He got the training from his former President John Mahama and so what do you expect; Mahama failed to control his boys, especially Nii Lante who has been a close friend of Mahama,” he said. Describing his comment as totally bogus and affront to probity and accountability, Mr Opoku-Prempeh called on Ghanaians to condemn the statement of the former MP for Odododiodoo. Mr Opoku Prempeh was speaking on Adom TV’s Morning Show “Badwam” on Tuesday. The Education Minister said the former President was noted for lawlessness when in power and therefore the comments by the former Minister do not come as a surprise to him. He described the comments as unfortunate, especially coming from an ex-government official whom he expected to know better. Mr Opoku-Prempeh indicated that Nii Lante Vanderpuye’s statement is a threat to the corruption fight in Ghana. Abuga Pele and Philip Assibit are serving six and 12-year jail terms respectively, for causing financial loss to the state. The court presided over by Justice Afua Serwaa Asare Botwe, found both accused persons guilty of all the nineteen counts levelled against them by the prosecution.